Hyundai has decided to unveil five new cars at the SEMA Show this year, but nothing quite matches the Bisimoto Sonata that has been made in collaboration with Bisimoto Engineering. Apart from that, Hyundai has decided to unveil ARK Performance AR550 Genesis sedan, Blood Type Racing Genesis Coupe, JP Edition Sonata and Toca Signature Edition Genesis sedan. The all new Bisimoto Sonata is the most powerful Sonata ever built so far. 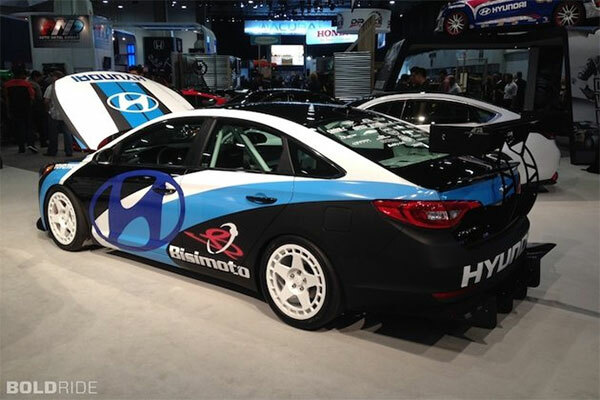 This will be the third year in a row that Hyundai has decided to team up with Bisimoto Engineering and to come up with powerful race track version vehicle. For this Hyundai has decided to make use of its 2.4 liter Theta-2 four cylinder engine that combines with other performance parts and produces 888 horsepower. In the earlier announcement, both Hyundai and Bisimoto had mentioned that they would come up with 708 horsepower vehicle, but they have been successful in exceeding that goal. There are various modifications that are being made to ensure that the overall weight of the car is reduced. Apart from the Bisimoto Sonata, Hyundai also managed to attract more visitors with Blood Type Racing Genesis Coupe that uses the stock 2.2 liter turbo engine and produces 700 horsepower and 600 lb feet of torque.